From (today) Monday 7th August, free bus pass holders will now have to pay to use the non-stop red arrow coach service from Derby to Nottingham, due to Derby City Council withdrawing the route from those it funds. The end to free rides from Derby for customers holding an English National Concessionary Travel Card follows a similar move by Nottingham City Council which took effect from April 2016. 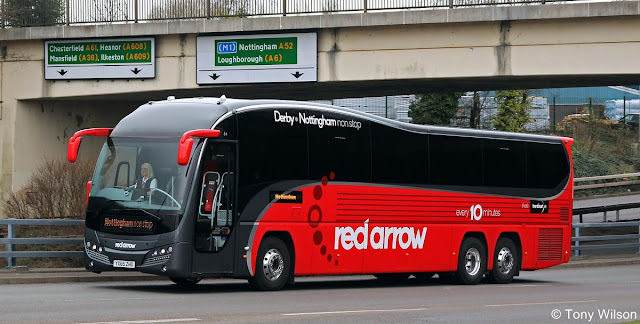 Derby’s exclusion of red arrow was announced back in March and Sunday 6th August was the last day for pass holders to travel to Nottingham for free. Jeff Counsell, managing director of trentbarton, said: “red arrow and trentbarton still very much value our customers who travel with a concessionary pass. “We hope many of them will value the red arrow experience, wish to continue using it and become paying customers. Derby City Council had also wanted to exclude the X38 express service between Derby and Burton, which trentbarton runs jointly with Arriva. But that proposal has been dropped and the X38 remains available to pass holders.